Well well well. After the Scandinavian wave, the Italian wave, the beginning of the Spanish wave, the Japan wave seems to arrive slowly but surely. OK since a long time now, Japanese bands have tried to invade Europe (Loudness) and we have discovered recently Concerto Moon (which has many other records by the way). Here comes fantastic Double Dealer. This band is playing melodic power metal and their singer (Shimoyama, Saber Tiger) is very good. The guitarist, Norifumu Shima (Concerto Moon) is again excellent. It starts with an excellent song, The Long Way Road, a kind of Malmsteen song "à la" US power metal. Pandora's Box, second track, sees the confirmation of a great singer. Shimoyama's list of idols goes from Ronnie James Dio to Ian Gillian & David Coverdale. Honestly I am not surprised, 'cause this guy has all the component of those great singers. Whooaaw, what a singer!!! This guys doesn't come from Japan ... he must be an alien. The rest of the record is as good as the beginning : The Enemy (third song) is a great mixture of Deep Purple and Whitsnake. Deep Blue Sky is a wonderful power-metal ballad and Primitive Live is better than Whitesnake. From striking guitar solos, crashing power riffs, together with hymn-like vocals and beating rhythms which are inspired by Dio, Whitesnake, Deep Purple and Malmsteen (for the guitar), this is a summary of the debut album by the Japanese melodic power metal formation. I have been really impressed by the quality of Double Dealer's song-writting : what an inspiration !!! Those guys will go very far if they continue to follow that path. BURRN! gave 93/100 for this one (Japanese metal mag) and I confirm you this is not a surprise, this is a DISCOVERY. Japan has finally their metal heroes. 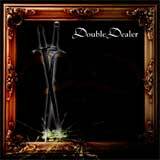 After many years, Double Dealer has everything it takes to become this Japanese's metal messiah we were expecting since a long time now. Excellent, really really excellent.